give out steady light without flame. Once I've created a new pattern, and it comes time to bestow a name upon it, I tend to be drawn to one syllable words, such as Blush or Breeze for example. There are exceptions, where I have two syllables such as Junction or Harvest, but for the most part I stick with one singular word. Why? No idea. Just do. Perhaps in my mind it's easier to say and remember? Sometimes naming a quilt is easier than others. Blush was an easy one and it just naturally fell in step with it's name. Some quilts are named due to a specific event that is occurring whilst I design and create the quilt. Harvest is a prime example, being designed whilst my husband works long hours during the grape harvest here in the Yarra Valley. But for me now, I think the ability to glow comes from an inner peace and happiness that sits contentedly inside ourselves. And I feel that while I created this quilt, I was in a state of peace and happiness. I had just survived two rounds of surgery and a metal plate insertion for a broken foot, a sudden and unexplained seizure, and was embarking on a successful weight loss journey. After enduring all those issues, I felt in a state of calmness. Did I feel any glow during those issues? No. It was only once I was on the other side. Once I had endured, that I felt the ability to just be still and enjoy peace. And perhaps that glow is reflected in this quilt. For whenever I see, and touch and wrap myself in this quilt, it never fails to warm me with it's cheer. And, perhaps it's because of it's glow that it proved itself as a very popular quilt when it was released in Issue 15 of Make Modern magazine. 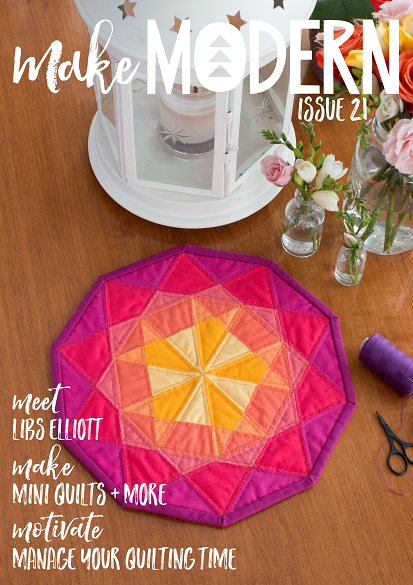 You can order and download the issue via this link and make the quilt for yourself. Whilst you're there, go on and subscribe to Make Modern magazine, a wonderful online magazine with each issue full of inspiring projects. I'll be having a gorgeous Christmas themed quilt coming up in a future issue - so be sure to join so you don't miss it.